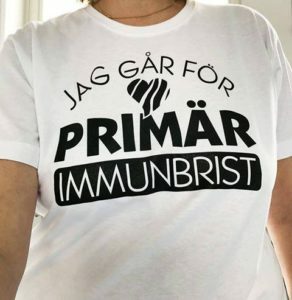 During World Primary Immunodeficiencies Week , observed from 22-29 April, PIO (Swedish PID Patient group) members and supporters across Sweden went out for Zebra walks to raise awareness for primary immunodeficiencies (PIDs) and funding for PIO. A total of 146 PIO supporters participated and walked a total of 538 hours in the Zebra Walks! The walks could be organised to take place anywhere and at any time and many of the participants dressed up to the part in black and white and a special “I walk for PID” T-shirt. The Zebra Walks had a great turn out on social media with many shares and positive feedback. PIO carried out a media campaign during WPIW focused on the inclusion of newborn screening for Severe Combined Immunodeficiencies (SCID). The Swedish National Board of Health and Welfare is expected to reach a decision regarding the possible inclusion of SCID newborn screening in the national panel of screened conditions and, meanwhile, PIO decided to take the debate to one of the most viewed prime time TV programmes. A mother who lost a child due to late diagnosis of SCID participated along with Professor Anders Fasth and Ms Anneli Larsson from PIO. Several newspapers and online publications got interested about the topic and published other reports which you can read here .